General Santos, officially the City of General Santos (Cebuano: Dakbayan sa Heneral Santos; Hiligaynon: Dakbanwa sang Heneral Santos; Maguindanaon: Ingud nu General Santos), referred to as General Santos City and abbreviated as GenSan, is a 1st class highly urbanized city in Soccsksargen, Philippines. According to the 2015 census, it has a population of 594,446 people. Located on the island of Mindanao, it is the southernmost and 15th-most populous city in the Philippines. It is the regional center for commerce and industry of the Soccsksargen region, and is geographically located within the province of South Cotabato but administered independently of it. Formerly known as Dadiangas, the city was named after Gen. Paulino Santos, a former Commanding General of the Philippine Army and the settlement's leading pioneer. The nomadic B'laan people are the original inhabitants of General Santos, and traces of their early settlement of the area are found in the city's place names, which are derived from their vocabulary. Their name for the city, Dadiangas, is from the thorny Ziziphus spina-christi tree that was once abundant in the area and is now a protected species under Republic Act 8371 or the Indigenous Peoples Right Act of 2007. The B'laan tribe presently lives alongside the city's new generation of settlers and other immigrants. Organized under the National Land Settlement Administration (NLSA) of the Commonwealth Government headed by President Manuel L. Quezon, General Paulino Santos led the relocation of 62 Christian settlers from Luzon to the shores of Sarangani Bay aboard the steam ship “Basilan” of Compañia Maritima on February 27, 1939. The 62 pioneers, mostly agricultural and trade graduates, were the first large batch of settlers to land in the area with the mission to industriously cultivate the region. After this first influx of pioneers, thousands more Christians from Luzon and the Visayas have subsequently moved into the area, gradually driving some of the resident B'laan to the mountains, who have lost their livelihood. In March 1939, the first formal settlement in the city was established in Alagao, which is now known as Barangay Lagao. Lagao district was known then as the "Municipal District of Buayan" under the jurisdiction of the deputy governor of the Municipal District of Glan. Until it officially became an independent Municipal District of Buayan on October 1, 1940, appointing Datu Sharif Zainal Abedin—an Arab mestizo married to a daughter of a very influential datu of lower Buayan—as the first district municipal mayor. During the Second World War, the Municipal District of Buayan become one of the last frontiers between the combined American and Filipino forces and troops from the Empire of Japan. Retreating Imperial Japanese forces made Klaja Karsts Land their last ground for defence, constructing round cement bunkers and tunnels. These bunkers can still be seen at Sitio Guadalupe; most of the tunnels, however, have since been damaged and even destroyed by treasure hunters and land developers. A year after the Philippines regained full sovereignty from the United States on July 4, 1946, the Municipality of Buayan became a 4th class regular municipality by virtue of the Executive Order Number 82, dated August 18, 1947 by President Manuel Roxas, absorbing the Municipal District of Glan whose low income bracket at the time disqualified it for the honour. Dadiangas was the seat of government for the Municipality of Buayan electing Irineo Santiago as its first Municipal Mayor on a local election that was held on November 11, 1947. Mayor Santiago was formally inducted on January 1, 1948. Six years later, in June 1954, the Municipality of Buayan was renamed General Santos as a tribute to the leading pioneer via Act No. 1107 authored by Congressman Luminog Mangelen of Cotabato Province. From 1963 to 1967, the municipality's economy experienced a boom under Mayor Lucio A. Velayo, as several large agri-based and multinational firms such as Dole Philippines, General Milling Corporation and UDAGRI expanded into the area. Although it was then qualified to become a fourth class city from being a municipality, the residents rejected a move by Congressman Salipada Pendatun to convert the Municipality of Buayan into a city and to rename it ’’Rajah Buayan’’. On July 8, 1968, the Municipality of General Santos was converted into a city upon the approval of Republic Act No. 5412, authored by Congressman James L. Chiongbian. It was inaugurated on September 5 of that year, with Antonio C. Acharon became the new city's first mayor. On the 5th of September in the year 1988, A decade after its inauguration as a chartered city, GenSan was declared a highly urbanized city of South Cotabato. General Santos City lies at the southern part of the Philippines. It is located at 6°7'N 125°10'E latitude. 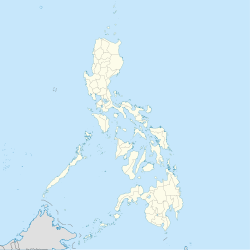 The city is southeast of Manila, southeast of Cebu and southwest of Davao. The city is bounded by municipalities of Sarangani Province namely Alabel in the east, and Maasim in the south. 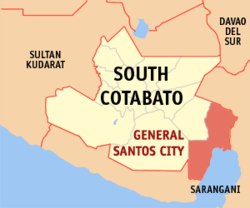 General Santos is likewise bounded by the South Cotabato municipality of Polomolok and Sarangani Province municipality of Malungon in the north, and the municipality of T'boli in the west. General Santos City has a tropical wet and dry climate (Köppen climate classification). It is considered to be one of the driest places in the Philippines, even with a less pronounced dry season. There are two major languages spoken in the city, with Cebuano being widely spoken and being used by the local media outlets in the city (television, radio, and newspapers), followed by Hiligaynon, which is used mainly by settlers who came from the provinces of South Cotabato, Sultan Kudarat, North Cotabato and Maguindanao, as well as immigrants from the provinces of Negros Occidental, Iloilo and Guimaras. The predominant religion in the city is Christianity, with the largest denomination being the Catholic Church, comprising almost 90 percent of the population. About 9% of the population belongs to Islam, mostly Sunnites. The city's major economic activity is primarily anchored in two sectors namely the agro-industry and fishing industry. Agro-industry: Endowed with rich volcanic soil, ample and well distributed rainfall all throughout the year and a typhoon-free climate, General Santos City produces export quality high valued crops such as corn, coconut, pineapple, asparagus, banana and rice. It also yields quality exotic fruits, vegetables and cut flowers. The city is also a top producer and exporter of quality livestock such as poultry, hogs, and cattle. But with the continuing growth in population and economy in the passing of time, a number of the city's agricultural lands have gradually been converted into built up areas in order to address the relatively growing need of dwelling and viable spaces. Fishing industry: General Santos City is the largest producer of sashimi-grade tuna in the Philippines.Thus in as early as 1970, the title "Tuna Capital of the Philippines" has become a tag to it. GenSan also accounts for the second largest daily total catch of fish in the country after Navotas City in the National Capital Region. Locals in the city boast that fishes and seafoods do not come fresher than what is found in their locality. The fishing industry in GenSan yields a total daily capacity of 750 metric tons of fish catch alone and employs about 7,800 workers. Which is why General Santos City is home to seven (7) tuna processing plants in the country. 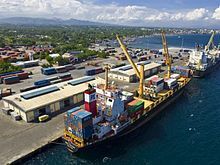 The Fishport Complex in Barangay Tambler has a 750 metres (2,460 ft) quay and a 300 metres (980 ft) wharf for 2,000 GT reefer carriers. The fishport is equipped with modern facilities that comply with international standards on fish catch handling. As of 2000, there are 59 banks serving the city. This composed of 46 commercial banks, 5 savings banks, 7 rural banks and 1 cooperative bank. Aside from this, there are 48 lending institutions as well as 49 pawnshops providing emergency loan assistance. General Santos City is the shopping capital of the Soccksargen region. Residents from nearby towns and provinces visit the city to do shopping and enjoy life and leisure activities. There are several huge shopping malls in the city, notable ones are KCC Mall of Gensan, SM City General Santos, Robinsons Place GenSan, Gaisano Mall of GenSan, RD Plaza (Fitmart), Veranza Mall, and the newest addition to the city which is RD City Mall located at Brgy. Calumpang and Unitop Shopping Mall in Brgy. Dadingas West. SM Savemore has two branches in the city and another branch will be built within the downtown area. There are also news about building an Ayala Mall and Puregold. These malls are home to both national and international brands of retail merchandises as well as restaurants and cafes. There are many merchandise and large groceries owned by local and foreign Chinese, Taiwanese and Korean businessmen in the city. Modern and state-of-the-art communication facilities at par with global standards are readily available and are provided in General Santos City by major telecommunication companies in the country. These include voice, data, internet and network solutions, among others, in both wired and mobile forms. GenSan and the whole of Soccsksargen can be reached by air, land, or sea. The General Santos International Airport is the largest airport in Mindanao. It has a 3,227-metre concrete runway capable of handling wide-bodied jets like Airbus A340 and Boeing 747. It was also called Rajah Buayan Airport in the 1990s and Tambler Airport in year 2008 before it was renamed to its current name. Flights to and from Manila, Iloilo, and Cebu are currently being operated in the airport by Philippine Airlines and Cebu Pacific. General Santos International Airport is the second busiest airport in Mindanao and 9th busiest airport in the Philippines. The Makar Wharf is the main international sea port of the city and is one of the finest sea ports in the country. It is location in Barangay Labangal, away from the central business district. With a 740 metres (2,430 ft) docking length and a 19 metres (62 ft) width, the wharf can accommodate up to nine (9) ship berthing positions all at the same time. The port is complete with modern facilities like container yards, storage and weighing bridges to name a few. Several shipping companies operate regular inter-island ferry service to and from other major ports in Luzon, Visayas and Mindanao. Negros Navigation, SuperFerry and Sulpicio Lines provide these inter-island shipping routes while numerous Indonesian shipping lines operate international ferry service between General Santos City and neighboring ports in Indonesia carrying both passenger and cargo loads. Commuting in and around General Santos City is a fast and convenient ride. More than 400 passenger buses, public utility vans and jeepneys wield routes within the city and neighboring provinces like in Koronadal, Cotabato, Davao, Tacurong, Pagadian, Cagayan de Oro and others. Three-wheeled motorized cabs known as tricycles are the city's main mode of public transport and have been on the road since the pioneering times. Air-conditioned taxis also ply the city streets offering commuters a choice of a more comfortable mode of transportation. Maintained by the City Engineers' Office, the city's major road networks are paved and endowed with safety road marks, signs and signals to ensure a secure and efficient traffic flow within the city. The Pan-Philippine Highway links the city by land to other major cities in Mindanao and to the rest of the country. The General Santos City Terminal—popularly known as Bulaong Terminal; located in Barangay Dadiangas North is the city's main integrated land transport terminal. The terminal serves as the city's gateway for land travelers. Buses and other forms of public mass transportation—to and from various parts of Mindanao such as Koronadal, Tacurong, Cotabato, Davao, Kidapawan, Digos, Pagadian, and Cagayan de Oro. Majority of the city's power supply is being serviced by the second district of South Cotabato Electric Cooperative (SOCOTECO-II). The said power distributor acquires the majority of its power needs for the city's consumption from the National Transmission Corporation (TransCo) while other sources are drawn from various Independent Power Producers (IPP) from nearby power plants and barges. Majority of the households and other entities in the city are provided and serviced with clean, safe and potable water supply from deep well sources by General Santos City Water District (GSCWD). Potable water sources in other far flung and remote parts of the city where cannot be reached by the local water utility service are being served by their individual Barangay Water And Sanitation systems. In a bid to achieve an efficient and sustainable management of non-hazardous waste the city produces every single day, the finalization and construction of the city's waste water treatment facility is currently underway at the corner of P. Acharon and I. Santiago Boulevards. The said location is adjacent to the city public market and is the former site of the city's Fish Landing. The facility will include settling ponds and anaerobic reactors, among others. Likewise is the finalization stage for the construction of a multi-million peso solid waste management and disposal system in Barangay Sinawal. The new and modern solid waste management facility will replace the existing city dumpsite in Barangay Siguel. The Philippine National Police, a military task force has been formed to protect the city from terrorist attacks and other crime. Task Force GenSan is affiliated with the Philippine Army and headed by an army colonel. 8 Police Stations are build on each barangay to keep the safeness and a peaceful order in city. Agencies and Organizations are forming a good and peaceful will to group an order in a city. The average life expectancy of Gensanon is 70 for females and 65 for males. There are 19 hospitals, with a total of 1,963 beds, in the city including GenSan Doctors Hospital, St. Elizabeth Hospital, SOCSARGEN County Hospital, Mindanao Medical Center, R.O Diagan Cooperative Hospital, General Santos City District Hospital and the newly built GenSan Medical Center in Barangay Calumpang servicing a care for the people. There is an ongoing construction of expected hospital in Barangay Apopong and Barangay Lagao along National Highway going to Barangay Katangawan. Aside from more than 50 Private Schools, such as The Quantum Academy, and more than 100 public schools, General Santos City hosts three universities. These are the Notre Dame of Dadiangas University, Mindanao State University - General Santos and New Era University - General Santos Campus. It also houses colleges such as the Doña Lourdes Institute of Technology. Soon, the General Santos campus of the country's oldest academic institution, University of Santo Tomas, will rise in Barangay Ligaya. Notable media publications in the city are the SusStar General Santos, Periodiko Banat, Sapol, and other local newspapers. Brigada Newspaper General Santos is the most popular newspaper company in the city. There are several television stations in the city that are owned and operated by broadcasting networks—ABS-CBN 3 Soccsksargen, GMA 8 Soccsksargen, TV5 Channel 12 Gensan, GMA News TV 26, Brigada News TV 34, ABS-CBN Sports+Action Channel 36, GNN Channel 43, and UNTV Channel 48. Most of these television networks reaches as far as Davao Region and Northern Mindanao; and caters the whole SOCCSKSARGEN Region. Major and other minor cable and satellite television companies are also operating in the city. Most of the FM and AM radio stations are operating in the city 24 hours a day such as MOR 92.7 General Santos, 89.5 Brigada News FM, iFM 91.9, 94.3 Yes! FM General Santos, Radyo5 97.5 News FM, K101.5 Love Radio GenSan, Barangay 102.3 GenSan and others. There are three local newscasts programs in General Santos: TV Patrol Socsksargen (ABS-CBN 3 Soccsksargen), GMA Soccsksargen Flash Bulletin (GMA 8 Soccsksargen), Balita38 (EGTV Channel 46) and Ronda Brigada (Brigada News TV channel 34). ^ "DTI features 'best of the seas' at the IFEX PH 2018". Philippine Information Agency. DTI/PIA-NCR. 26 May 2018. Archived from the original on 26 May 2018. Retrieved 17 April 2019. ^ a b "Province: South Cotabato". PSGC Interactive. Quezon City, Philippines: Philippine Statistics Authority. Retrieved 12 November 2016. ^ ""History of General Santos City"". Archived from the original on 2011-07-11. Retrieved 2018-12-10. ^ "An Act Changing the Name of the Municipality of Buayan, in the Province of Cotabato, to General Santos". LawPH.com. Archived from the original on 2012-07-14. Retrieved 2011-04-11. ^ "General Santos City, South Cotabato Climatological Normal Values". Philippine Atmospheric, Geophysical and Astronomical Services Administration. Archived from the original on 13 October 2018. Retrieved 13 October 2018. ^ "General Santos City, South Cotabato Climatological Extremes". Philippine Atmospheric, Geophysical and Astronomical Services Administration. Archived from the original on 13 October 2018. Retrieved 13 October 2018. ^ "Province of South Cotabato". Municipality Population Data. Local Water Utilities Administration Research Division. Retrieved 17 December 2016. ^ Philippine Statistics Authority (July 26, 2017). "Muslim Population in Mindanao (based on POPCEN 2015". Archived from the original on August 31, 2018. Retrieved August 31, 2018. ^ Fel V. Maragay (July 4, 1996). "Demos in South get ugly; Ramos unfazed: Mindanao Council is good formula, FVR insists". Manila Standard. Philippines. Retrieved October 9, 2011. ^ "General Santos International Airport". Archived from the original on 2010-09-19. ^ "RESOLUTION RENEWING AND REVITALIZING THE EXISTING SISTER CITY TIES OF THE CITY GOVERNMENT OF GENERAL SANTOS WITH THE CITY OF NAGA, CAMARINES SUR" (PDF). Archived from the original (PDF) on 17 April 2019. Retrieved 17 April 2019. ^ "DIRECTORY OF AUSTRALIAN SISTER CITY AFFILIATIONS 2018" (PDF). Sister Cities Australia. Archived from the original (PDF) on 1 July 2018. Retrieved 17 April 2019. ^ a b c "GENSAN and JERSEY CITY to Sign SISTER CITY Agreement AUGUST 14". Gensan Magazine. 2 August 2018. Archived from the original on 12 January 2018. Retrieved 17 April 2019. Come August 14, Jersey City will become Gensan’s third international sister city (after Monterrey, Mexico and Hadano City, Japan), while Gensan becomes Jersey’s second Philippine sister city (after Ozamiz City, Misamis Occidental). ^ "Jersey City and GenSan now "sister cities"". Philippine Daily Inquirer. INQUIRER.net US Bureau. 30 August 2018. Archived from the original on 29 August 2018. Retrieved 17 April 2019. Wikimedia Commons has media related to General Santos. Wikivoyage has a travel guide for General Santos City.